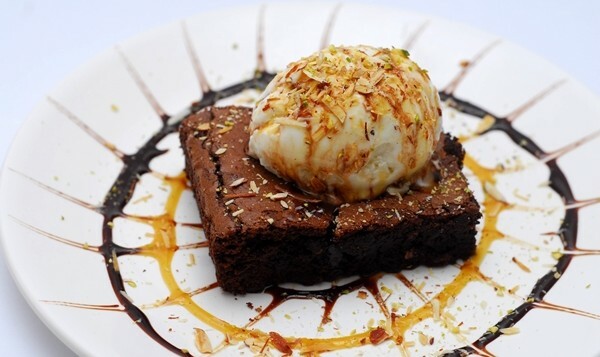 Nishant Vijaykumar has put a lot of effort into his creative brownie desserts, but we cana��t help but start talking about his home made ice creams first. The citrus (refreshingly spiked with mandarin orange zest) and mint (a moss green melange of cream and crushed mint leaves) ice creams that he crafted to be enjoyed atop his brownies, make a case for themselves. This youngster started experimenting with brownies two years ago, creating flavours ranging from rum and raisin to peppermint. But after completing his management training in New Delhi,A� Vijaykumar returned to set up Progressive Cuisine Concepts in Chennai. a�?I want to do product-centric brands,a�? says the lad, who will experiment with idlis and momos once hea��s bored of brownies. At Brownie Heaven near New College in Royapettah, you will find a humble display housing different shades of brown slices. Therea��s Nutella, chocolate marble and peanut butter on our visit. But open the menu and you find names like brownie banofee, brownie custard, brownie black forest and the brownie web. These are various combinations of your choice of brownie (he offers over 20 flavours) with sauces, whipped cream, chocolate shavings and fruits. And if you want something really outlandish, try the one topped with crushed potato chips and ice cream, that reminds us of the potato chips dipped in chocolate made popular by Japanese brand Royce. It gives you a mix of flavours (sweet and salt) and textures (crunchy, gooey and creamy). We are curious to see what the brownie tiramisu, cheesecake and brownie gulab jamuns will taste like when Vijaykumar launches them after completing the kilos of brownie plum pudding he is sending out for Christmas. Oh, and dona��t leave without trying the filter coffee soda.